Every once in a while there comes along a writer, an already accomplished storyteller, who grows into the stature of a great writer through one wonderful story. 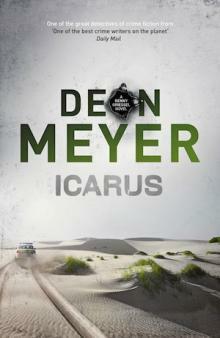 That author is Deon Meyer; the story he has masterfully crafted is Icarus. From that single sentence we are propelled into Benny Gunther’s pursuit of justice, and the determined people around him who are intent on discovering the truth. Alongside is the story of a lawyer looking to do justice to the case of the one person that the police definitely need to interview. It is an unbelievably fine piece of storytelling, just as much rooted in history and family as it’s setting in the modern world of Internet millionaires. ICARUS takes you around a carousel ride of suspects, financial doings and undoings, marital infidelities and a multitude of motives. It has wit, passion, envy, family, courage… it has a little of everything and it will keep you guessing till the very end. The rich ensemble of characters are a pleasure to meet. They range from the victim’s elderly mother, for whom he is a worry, to the woman who has held together Alibi, the entrepreneur’s flagship business, to Vaughn Cupido, Benny’s stand-in who has to run the investigation while covering for Benny’s lapses. Above all there is Benny. Benny who is all too vividly human. Read the two extracts, get a sense of Deon’s writing but make sure you grab a copy of this book before there are none left. You won’t be disappointed. This Icarus will fly – fly off the shelves of bookstores. ‘Big coincidence,’ Jamie Keyter at his ironic best. Jamie Keyter lifted his Ferrari sunglasses off his nose, to give Bannister the I-can-see-right-through-you look. The man just stood there, waiting uneasily. ‘So you have everything on video?’ asked Keyter at last. Together they watched the video on the cellphone. Twice. ‘Okay’ Keyter said, and ordered Bannister to go and wait at his car. The adjutant replaced his Ferrari glasses on his nose. In a black polo golf shirt that displayed his bulging biceps and black Edgars chino trousers with black leather belt, hands on hips, he stared at the two feet protruding from under the black plastic. He was pleased with himself. The feet, despite the post-mortem discolouration, were clearly those of a white man. That meant media attention. Jamie Keyter loved media attention. Benny Griessel, forty-six years old, rehabilitating alcoholic, six hundred and two days on the wagon, sat and stared through the windscreen of the car, stuck in the traffic jamming up Buitengracht. Usually he would curse the holidaymakers’ madhouse with a muttered ‘Jissis’. Especially the ‘fokken’ Gautengers who raced down to Cape Town as fast as they could in their shiny new BMWs, their fat wallets ready to blow all their Christmas bonuses with that ‘We’re gonna shake the Cape awake’ attitude; and the entire population of the Cape’s northern suburbs who abandoned their regular inhibitions and streamed down to the beaches in droves. Along with the hordes of Europeans fleeing the winter cold. Usually he would brood resentfully on the consequences of this invasion. There was no parking, the traffic stank, prices doubled and crime rates went up at least 12 percent, because everyone drank like a fish, which unleashed all the wrong demons. Usually. But not this year: the oppression was in him and over him and around him, like a disconsolate cloud. Again. Still. The momentary relief of his escape from the Ocean Basket had evaporated. On the way to the car the melancholy in Mbali’s voice had registered with him – the muted dismay, accentuated by her attempt to disguise it. In stark contrast to the positivity she had tried to radiate over the past two months as group commander. Something bad was brewing. And he didn’t have the strength for disaster any more. So today the December madness and the snail’s pace traffic wasn’t so much a thorn in his flesh, but a blessing. The forensic team had exposed the full length of Ernst Richter’s corpse. Adjutant Jamie Keyter called the video team closer so they could record it: the thick black plastic rolled around the body, just not long enough to cover the feet, and the blood red rope with which it had been so thoroughly bound – up near the head, around the middle and down at the ankles. Keyter had seen the newspaper photographer trying to take photos from Otto du Plessis Drive with his long lens. That was why he stood with legs apart, hands on hips: the image of a detective in control of the crime scene. He kept an eye on the video team, until he was satisfied that the recording covered all the suitable angles. The two forensic analysts chose the right tools from their kit, lifted the crime tape and knelt beside the victim. One carefully cut the cord loose. The other picked up the cord and packed it in an evidence bag. Adv. Susan Peires (SP): … Of course you may refuse. Then I’ll just make a note. But the recording is a much more reliable record, and it’s handled with exactly the same discretion. I will have it transcribed, which can serve as reference notes as well. The rules of privilege still apply. Francois du Toit (FdT): Even if you don’t take my case. SP: My secretary, who is also the subject of privilege. FdT: Very well, record me then. SP: Thank you, Mr Du Toit. Can you state your full name, date of birth and your profession for the record. FdT: I am Francois du Toit, born on 20th April 1987. I’m a wine farmer from the Klein Zegen Estate in Stellenbach…Out on the Blauklippen Road. SP: You are now…twenty seven? FdT: Yes. To San…Susanne…We have a son of six weeks, Guillaume. SP: Thank you. I understand from your attorney that the police are waiting for you right now? On the estate? SP: And you are requesting advice on how to handle the situation. SP: What is the police investigation about? FdT: Gustav…my attorney…hasn’t he told you? SP: I gathered it was serious, but I asked Mr Kemp not to provide any details. I prefer to hear it from the client directly. FdT: It…it’s connected to the murder of Ernst Richter. SP: The man who went missing? The Alibi Man? SP: And you are involved in that? FdT: The police would surely not…I’m sorry. It…It’s a long story…I have to tell you the whole…Please.